Our panel of Latics experts have their say on last weekend’s draw with Brentford - and preview a crucial week ahead with trips to Bristol City and Hull. Sean Livesey: Saturday followed a well worn path for Wigan Athletic at home. If not the best of the play they certainly had the best of the chances. 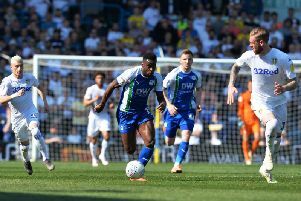 Reece James’ spectacular effort, Chey Dunkley’s bullet header and effort that came back off the upright along with the one on one that Gavin Massey really should have converted. Not to mention the disallowed goal from Anthony Pilkington. It was a solid defensive display by Paul Cook’s side although, looking at how Brentford fared against Swansea a couple of days later, I imagine there’s disappointment Latics couldn’t get a goal. A goal that would have gone a long way to helping Latics secure their Championship status for another season. It looks like this could well go down to the final couple of games of the season. If it does Latics need to amass as many points as possible between then and now. It was heartening to see Frank Lampard’s Derby County (c) put Rotherham to the sword on Saturday. With Rotherham’s remaining fixtures, not many would bet against the current bottom three being the ones who drop through the trap door. But as Bolton showed on Saturday, football can be unpredictable and that’s why Latics have to get as many points as possible. So on to Saturday – Bristol City have more than exceeded expectations this season. They’re flying high and the job Lee Johnson has done over the last few years will have made the rest of the league stand up and take notice. It feels a long time since we got the better of them at the DW in September – a win that at the time took us up to third in the table. A barren winter that followed has seen us now in the precarious position we are in. Everything is still in our hands though, and although no one will be backing Latics this next week that away form has got to change at some point. What better time to do it than now? Paul Middleton: It would be easy to look back at last Saturday and say, again, that we played for a draw. Except, for once, we didn’t. If Massey had scored, if Reece’s shot had gone in, if Chey hadn’t hit the bar, if…if…if. But it showed that we at least seemed to be willing to go on the attack every now and then. However, I am going to direct just a small bit of disappointment at Joe Garner. When Anthony Pilkington had the goal disallowed everyone thought he was offside, but it appears not. From where the linesman was, it looks like it was Garner who was actually the man offside when he headed the ball back in. How a forward looking straight across the line from a free kick can be offside is anybody’s guess. It’s things like that which often decide whether games are won or not, and we can’t afford to be throwing away a single goal in the “for” column. Otherwise, the performance really wasn’t too bad at all. It was certainly an improvement on most games this season, despite not winning. And I’m not even going to mention the awful substitutions. But the biggest problem isn’t with the 39 games we’ve played, but the seven we have left. All but the last two, against Birmingham and Millwall are against teams in the top half, with three in the top six. Four are also away from home, where we have the worst record in the Championship and better than only Fulham in all four divisions. Assuming we get nothing from those four away games, which is entirely possible, we could still be in big trouble. The last two games, against other relegation-threatened teams, could make or break us. While Ipswich look as good as gone, Bolton have staved off not just administration, but actually being wound up. Should Ken Anderson find some way to pay the players and staff, you can never rule out them winning two or three games. And that might be all it takes to dump us in the bottom three. Any Latics fan who thinks we’re safe is fooling themselves. This will go to the wire, and it might just be barbed enough to cut us much deeper than we’d like.